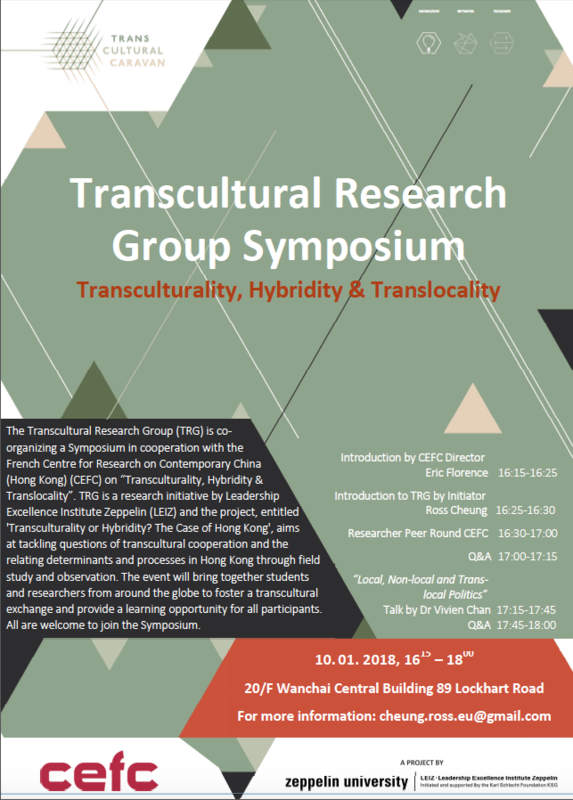 The Transcultural Research Group (TRG) is coorganizing a Symposium in cooperation with the CEFC Hong Kong on “Transculturality¨ Hybridity & Translocality”. TRG is a research initiative by Leadership Excellence Institute Zeppelin (LEIZ) and the project entitled “Transculturality or Hybridity? The Case of Hong Kong¨, aims at tackling questions of transcultural cooperation and the relating determinants and processes in Hong Kong through field study and observation. The event will bring together students and researchers from around the globe to foster a transcultural exchange and provide a learning opportunity for all participants. All are welcome to join the Symposium.